College finals can be a stressful time, especially for first year students. As a parent, you might be struggling with how to help your student during this stressful period other than reminding them to get enough sleep, eat well, and hydrate – which are actually very important. Although we can’t give you the exam answers or write any finals papers for them, here are seven tips parents can give students during finals season. Most importantly, students need to make sure they know when their exams are and what they need to have ready for each. Double and triple check each exam’s schedule, its syllabus, and any instructions from the professor more than once. The exam will likely at a different time and not the same as your normal class schedule. If there are any papers or projects that need to be completed leading up to the exam, make sure they know when the assignments are due and what the requirements are. A professor will have little sympathy if the exam is missed due to not knowing the schedule, or if the final project isn’t submitted because it was on the original syllabus your student hadn’t referred to since the first week of school. Studies show that studying for large blocks of time for one subject isn’t as beneficial as breaking up your time and moving between subjects. Remind your college student that studying in chronological order of the exam schedule likely isn’t the best planning method. Studying in blocks of time, say one hour per subject, for the days and weeks leading up to the exam is more beneficial. The repetition in going back helps in retaining knowledge more than fatiguing one’s mind with multiple hours of the same subject at once. Not everyone thrives in a silent environment and others can’t have any sound to distract them while studying. Encourage your college students to recognize what works best for them and stick to it while studying. Recommend places like the library, campus center, or coffee shop. Always recommend against the apartment or dorm room. These places come with many distractions, including inviting beds to nap on. Your student will likely balk at this suggestion, but at least while studying, removing the distraction of social media and other mobile apps is beneficial. We all know how easy it is for “just checking” something on your phone to turn into hours of mindless scrolling. During study time, focus is key. Removing the temptation of social media can help. It’s easy to push off any research papers or projects until the end of the term, but what if your student has multiple deadlines on top of exams? The study period leading up to exams can end up being filled with research and work on those assignments leaving little time for actual studying. Urge your student to get those papers or projects done in advance. That way the study period can be used for actual studying. 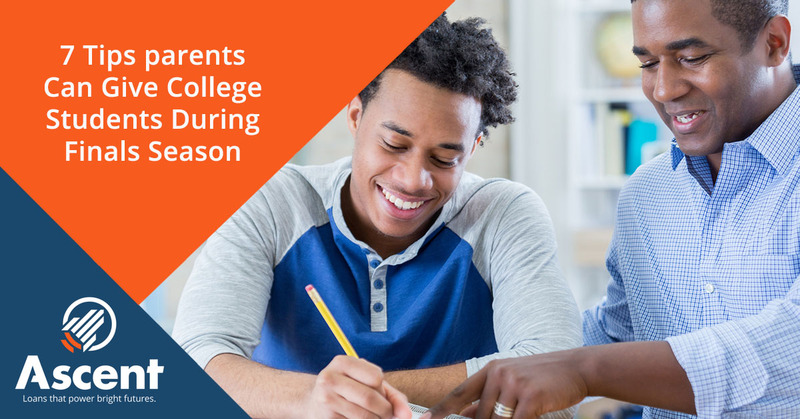 There are resources provided at colleges to help students. Encourage your student to take advantage of them, especially if your student is struggling with any of their classes. Professors have office hours to work with their students, colleges usually offer tutoring, and students create study groups all to help ensure academic success. Remind your student that he/she is not alone and that these resources are there to be taken advantage of. It’s also important to relax and have fun during this time – after the study goals have been met. Many campuses offer events to help de-stress students. Remind your student to take advantage of them or encourage them to reward themselves with their idea of a fun time on their own. Their minds need to relax after studying just like our muscles need to relax after a tough workout. 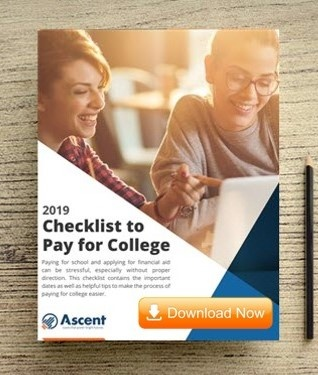 Ascent Student Loans is determined to provide students with the information they need to make their college dreams a reality. Stay in touch with our blog section to find the latest in college finance news.